This post is going to be a little bit different than anything else to date because it does not have a recipe attached nor is it something that just anybody can do and I don’t mean that in a negative way. It’s simply that this post won’t appeal to you if you don’t have an old BBQ sitting around gathering rust. The BBQ pictured on the left is one of the first charcoal BBQ’s I ever purchased and although it was useful in the beginning it simply didn’t really fill my need and so it was eventually replaced and wound up being relegated to the side of the house where it started collecting rust. Fast forward a couple of years and what was once my vegetable garden has now become my better half’s domain with “plants and bushes and trees”—– Oh My! 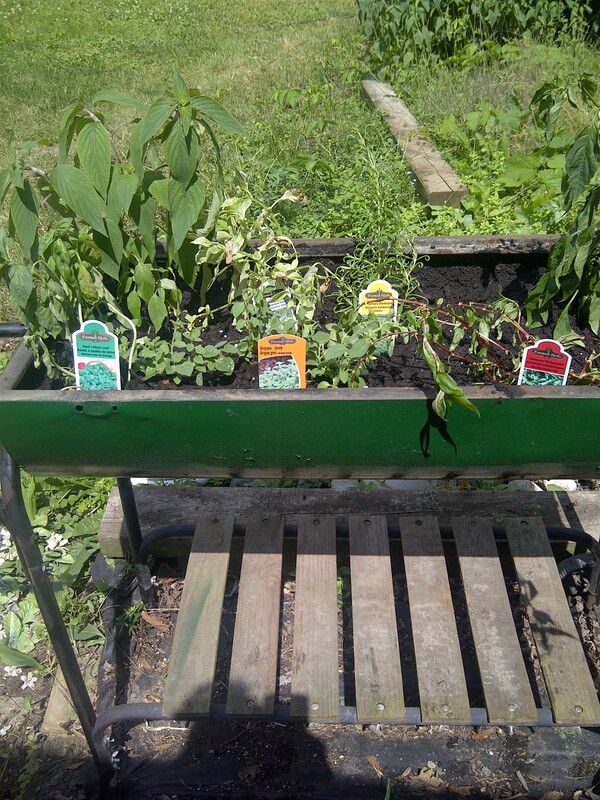 So I decided to revitalize my old BBQ and turn it into a Herb garden…. that’s half the finished product on the right which happens to be the bottom part of the “cue”. This kind of project is easy and does not take long as it is a simple matter of clean out the dirt, scrape off the rust and paint it with a colorful Rust Preventative paint. As I said this is the easy part. If you’re a cook like me choosing the right herb to plant is the hard part and you do need to put some thought into it or you will wind up with a bunch of stuff you can’t use and you have then wasted your money. When I picked the ones that I wanted I took a look at the things I like to cook and then designed the herb garden to compliment my recipes. I now have things like Pineapple Sage, which is excellent with poultry, Vietnamese Cilantro— Why?— Why Not?, Greek Oregano, Habaneros and Jalapenos—- Okay those last two are not herbs but I like to use hot peppers in some of my dishes and sauces. I have two types of Basil-— one for spaghetti sauce and one for pesto and something I have never cooked with in my life but I am ssssssooooooo looking forward to using it—— Tomatillos—- otherwise known as Mexican Tomatoes and I only wound up with these because the lady at the garden center has them growing wild in her garden. Tomatillos make an excellent Salsa Verde (green chili sauce) for which I can use the hot peppers and Cilantro I am growing and then include it in things like Chicken Enchiladas, Green Chicken Tacos or simply as a dipping sauce for homemade Nachos and this is why it is important to match your cooking style with what you grow. So as you can see Revitalizing something like an old BBQ can open up a whole world of new projects and can make your favorite dishes sing with flavor. I still have to finish what was the top part of the BBQ and that will be part two of this post so please stay tuned and until next time……..